For a fleeting moment I was over the moon when a random twitter message led me to what I thought was a new John Scalzi short story. “Yes,” I said to myself. “I finally get to review something of his hot off the press.” I fired up my Kindle only to see an original copyright date of November of 2010. Damn, Johnny come lately once again. 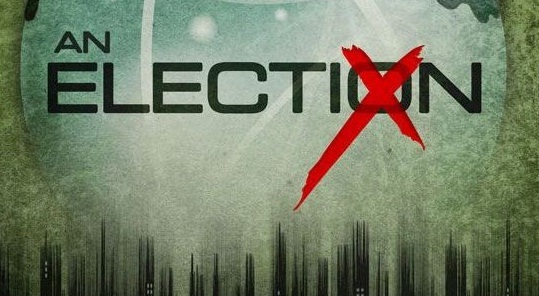 As the title suggests, An Election treads into territory that was previously the sovereign domain of Laura Roslin’s oft mentioned back story: local politics. This tale begins with David Sawyer announcing to his husband that he will be running for city council in an upcoming by-election as their district’s former city councilman was splattered by a bus. There are only two problems with David’s plan: he and his husband reside within a ward where humans are a racial minority, and said district has not elected a human councilman in nearly half a century. Even within this opening movement An Election offers so much to enjoy. I’ll start with the world in which it is set. When I think about aliens and humans living together, I go to one of three places, Star Trek’s 24th century San Francisco, Alien Nation’s 20th century LA, or more recently District 9’s 21st century Johannesburg. But where Star Trek is too milquetoast in its race relations, District 9 too oppressive, and Alien Nation too assimilated, An Election strikes a perfect balance between the three. Humans are very much in charge of this city, but only to the extent that the polyglot alien vote, along with their associated religious fringe groups and Canadian hating xenophobes, are important to the political landscape, or at least its expected image. Naturally, the allegory in play isn’t buried too deep within the text. It is, however, subtle enough to allow for more than one interpretation therein. Though I’m tempted to wax eloquent on urban spaces as colonizing forces, it would likely do this story an injustice as comedy is at the absolute crux of David Sawyer’s life on the campaign trail. 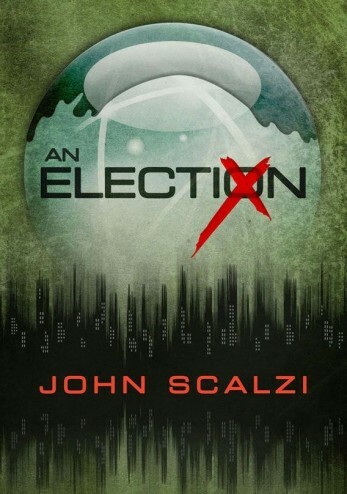 John Scalzi is often hailed as a successor to Heinlein. Having enjoyed every word of his debut novel, Old Man’s War (Sidebar: I once had the pleasure of talking to Mr. Scalzi about what I saw as a relationship between the Colonial Defence Force’s policies and the Bush Doctrine of pre-emptive warfare. This happened after another conversation where I gushed to him about how much I enjoyed Agent to the Stars. It was a good weekend for me.) I’ll attest to the veracity of that statement. Yet such a statement should not undermine this author’s consistent ability to make his audience laugh. An Election captures the precarious balance in contemporary politics between battles of sophism and the slapstick gaffes that fuel Jon Stewart’s wildest fits of incredulous apoplexy. David goes from making an oath to his husband that he will not be insufferable in inevitable defeat, the two are the quintessential old married couple, to having his campaign manger remind him that Gherkins are pickles and Hegurchans are part of the electorate. Speaking of aliens, Scalzi writes extraterrestrials in a way that I can only describe as Scalziesque. Many writers seem compelled to describe every nuance and detail of their aliens, Scalzi, not so much. In my experience, he is the sort of writer who gives just enough detail to connect his alien to something already known, or to offer a conceptual framework that a reader’s imagination can fill in on their own. For example, a Hegurchan is described as “a tall creature with an array of facial tentacles…” When David introduces himself to a Hegurchan voter, the alien’s “face tentacles extend straight out and…wrap around David’s head, pulling him into an intimate embrace.” I don’t need any more details to know that this thing bears a similarity to Futurama’s Doctor Zoidberg. Yet for all their strange appearances and mannerisms, the all too human desires and motivations of these aliens make them totally accessible to a reader. Again, it’s a balancing act that Scalzi pulls off with the utmost aplomb. The only weakness I can see in this otherwise flawless story manifests itself in the defeatism that orbits David’s campaign. At every turn, David is told that he has no chance of winning the election. Even his own campaign manager suspects that a rival candidate, whose only platform plank relates to the freedom to eat a neighbour’s pet, will do better than David. So much inverse foreshadowing so early on made it pretty clear that David will end up as more than a token human candidate. At the same time, the constant doubt and bad mojo directed at David serves to make this comedy of errors/political manoeuvring that much more genuine and charming. An Election is currently available as an e-book for the Kindle and Nook from Subterranean Press. It is the best .99 cents you could spend. But why spend anything at all when I’ll contest away a couple copies. Leave a comment on this post by high noon-ish on Wednesday, January 18th and you will be entered to win. +2 for start to finish humour that opens the door to no end of allegorical interpretation. -0.5 for a bit too much “David’s going to lose” bait and switch foreshadowing.